PRODUCT DESCRIPTION: This deluxe spreader is designed to apply granules on lawns and gardens. The granules can be any type of fertilizer or insecticide. All work off the same principle. This is the deluxe model, however this still has similar features as the other two spreaders. 5) All propel granules evenly and consistently. 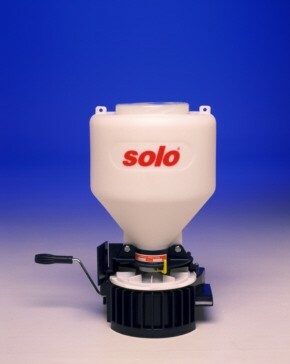 This Solo Spreader Deluxe model can hold far more then the other two and has many features and design advantages making it supreme for jobs on turf that will be over 10,000 sq/ft. 1) It has a holding tank which is 5 times as large. This allows for less fill ups and more coverage per tank. 2) It has a comfortable carrying strap which goes around your neck and shoulder so your body is able to carry the extra weight easily. This makes the work and weight much easier to manage. 3) It has a much better turning mechanism which lasts longer, is easier to turn and it's prop propels the granules more evenly and consistently. 4) It has a wider range of adjustments insuring you get the right flow. 5) It has a directional setting so you are able to control exactly what side of the unit granules come out. 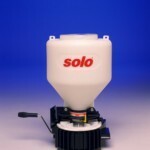 The Small unit propels granules at a fixed 180 degrees. This unit starts out at 180 degrees but you are able to reduce it just about nothing which is handy when you have small areas you need to treat and don't want to waste material. 1. How holding a spreader and dispersing granules in front of the body doesn't get debris all over a person walking behind it. 2. Exactly in what ways are your spreaders better than the kind with wheels that are pushed on the ground. First, all of our hand held spreaders disperse material forward. In fact, if you crank quickly, they will propel the granules out and away from the applicator (over 5 feet forward no problem). And the Solo Spreader featured above has what I would call "swath control". What I mean by this is that you can actually control how wide of an area the granules come out. So in fact you can narrow the width to just a few feet directly in front of you or to just one side if needed. To understand what I mean, imagine a pizza pie and then imagine the pie is cut into 8 slices. Now imagine the pie is 10 feet wide and that you're standing right in the middle. If you were to use our the spreader on this page, the 4 slices behind you would not get any granules applied on them assuming you were to crank and stand still, facing in just one position. But if you simply turn around in circle while cranking? You could effectively treat the entire area covered by the pie. Now what if you only wanted to treat 1-2 slices to the right? Well, you could dial the "swath control" to cover any one of the four slices in front of you so this would be possible. These features give the hand held units a big advantage over a wheeled unit – especially when treating flower beds, thick ground cover, around bushes, etc. And since I use both around my home, I can tell you my hilly lot has areas where the push unit is a pain but these areas are easy to handle with the hand held unit. Another feature of the hand held units and one I commonly use on my lot is to walk backward as I'm cranking. This means I'm effectively walking away from the granules as they're dispersed which in turn enables me to avoid walking over the treatment. This is tough to do with most any wheeled spreader and in general, not an option. Lastly, there is no way that a hand held unit is "better" compared to a wheeled unit and we don't make any such claim. Its kind of like comparing apples to oranges; they're both fruit but taste different. But hand held spreaders have advantages and besides all of the above features I listed above, there is one big one. Since most of our granules don't required excessive amounts of material applied, I have found the wheeled units can be wasteful. Granted, wheeled units will prove to save time when you need to treat wide open turf. This is especially true if you need to cover 10,000 sq/ft or more. With that being said, wheeled units can be wasteful. I say this because many of our products require a more precise application. And no doubt a hand held unit is a lot more "safe" for the local environment. Think about it. For obvious reasons, you don't want to run wheels over flowers and other sensitive plants. So for a small yard, flower beds and many areas around most any home, the hand held is a good match. But its not intended to replace a wheeled unit and in most cases, using both will be the way to proceed.